Classically inspired piano solos that span the spectrum of emotions. 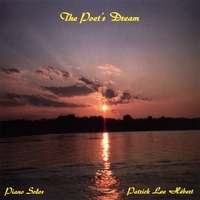 Patrick Lee Hébert's second solo piano album is a beautiful package featuring a variety of pianistic styles and moods. They range from soothing, thoughtful pieces to upbeat rags, and show Hébert to be a multi-faceted artist. My favorite piece is "The Jealousy of the Moon", which is spare, mysterious, and darkly beautiful at the beginning and builds to intense passion with rolling arpeggios and crashing bass lines- A wonderful piece! "Amber Skies" is warmly optimistic and evokes a cozy smile, while "Winter Night Sky" is cool and aloof. I also really like " Hollow Workings", which begins and ends quietly, but builds to a strong and fervent climax. "I can still hear your voice in the wind" is loving and wistful. "Southern reflection" is a slow, gentle vignette. Many influences are suggested in the various tracks-- a little David Lanz in Amber Skies; George Winston in Silent Tears, Hollow Workings and the rags; Erik Satie in some of the spare melody lines; perhaps Chopin in the Jealousy of the Moon. As a great fan of blues piano and ragtime, the three upbeat pieces add variety and interest, but are also a major mood change. Many of the fifteen tracks on this CD are absolutely gorgeous, and fans of solo piano music would do well with this CD! Beautiful collection of piano solos that bring the listener into the sound. The mood changes with each piece. a bad track on this CD. Jealousy of the Moon has to be my favorite song on this CD. I bought the CD after hearing just the last minute or so of the song on the radio one night. It is a very moving piece of music.